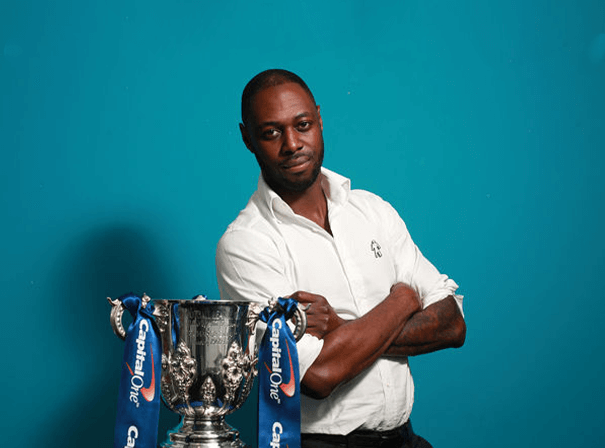 Ledley King is a highly regarded former English Soccerer who played for Tottenham Hotspur for his entire career. The Bow, London born talent retired in July_ 2012 after a successful career and is now a popular sports personality who adds real value and excitement to any event, function or dinner. Highly rated as a central defender, in 2009 Ledley was named by The Times as Tottenham’s 25th best player of all time, while he also made an impressive 21 international appearances for England. He represented his country at all levels and managed two goals for the team. In the latter part of his career after debuting against Liverpool in 1999, Ledley was sadly plagued by chronic knee problems, for which no effective treatment or remedy was found. Instead of training with the rest of the squad King undertook fitness exercises on his own, allowing him to play one first team game per week. Whilst playing, King was cited by opponents and pundits as one of the best defenders in the Premier League and this dedication to the case and strong motivational streak is what really sets him apart. King announced his retirement from all forms of Soccer on 19 July 2012 as a result of the chronic knee injuries that plagued much of his career. He continues to represent Tottenham Hotspur on an ambassadorial level, whilst appearing as a pundit on ITV and Sky Sports.